Are you struggling to find a toy that is both educational and entertaining for your toddler? Toddlers love the hands-on engagement toy blocks give them. Not only can they help keep your little one busy, but they can also have many developmental benefits. Toddlers tend to get bored with certain toys quickly, but blocks seem to have endless possibilities for fun. There are so many different types on the market that it can be overwhelming to pinpoint which ones are the best fit for your toddler. Here’s what you need to know in order to pick the best set of blocks. Use the links above to check the latest prices or read our in-depth toddler block reviews below. Why Are Blocks An Effective Toy? How Many Types Do You Need? We aren’t talking the oh-so-famous Legos here, although there are some similar blocks for toddlers. Blocks designed for toddlers are typically colorful structures that can be combined or stacked together in a variety of ways. There are numerous sizes and shapes your little one could play with. They have to be large enough so they don’t fit in the mouth. They must be free of small pieces that could be easily broken off. Toddlers need a stimulating environment to keep them interested and sometimes other toys can’t offer that stimulation. The flashing lights and funny noises of other toys only last so long until your little one realizes that all this fun stuff can happen by the push of a button. Blocks are a game changer because there are so many different things toddlers can do with them. Toddlers need toys that can be used in a variety of different ways (source). Toddlers are gradually becoming more and more independent. They want toys they can figure out on their own, and then be proud of their accomplishments. When toddlers are stacking their blocks, they have visual confirmation of the progress they are making. They get to explore different options and let their creativity take the lead. There is no right or wrong way to play with them, so all toddlers will succeed (source). The market for toy blocks is definitely a big one, and it seems that almost any type of block exists. The best part about this new toy is that your child’s imagination gets to shine. They can create anything they want and use them in ways that you or I may have never thought about. Toddlers still love to stick things in their mouth, so make sure the blocks aren’t small enough to pose a choking hazard. If it might end up in your little one’s mouth, make sure it can withstand some chewing and some slobber. Some blocks are made of cardboard which can wear down and turn into smaller pieces, creating a potential choking hazard. You also want to make sure the blocks can withstand the tiny human wrath that awaits. Toddlers always love to put their toys to the test. Durability is important so you don’t find yourself back at the store in just a couple of days. There are many different types of materials, so try to have a predetermined type in mind. You may want foam, plastic, or something in between. Some blocks are just for fun and there are some that have a more educational purpose. If you are hoping to get more of an educational toy, look for blocks that have different colors, letters, or numbers on them. Some block sets may have a higher price tag and come with significantly less. Make sure you are getting enough blocks if you choose to pay more. Many reasonable options on the market are worth the extra money. Now that you are more familiar with the different types of blocks and what to look for when buying them, here are our top picks. Jumbo building blocks are a fun and safe toy for small fingers. Your little one will love having a block that can be easily manipulated. 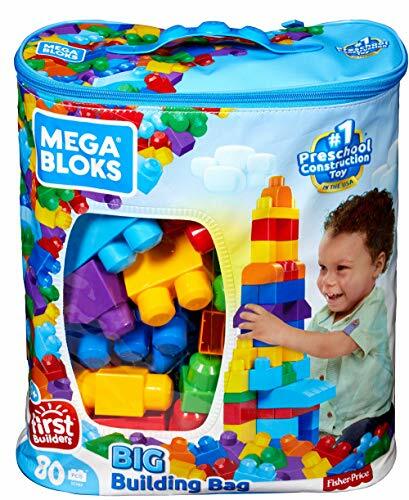 Mega Bloks are the holy grail of blocks for toddlers. It is almost as if this set of blocks is necessary for your child to be inaugurated into toddlerhood. Parents rave over this product and rightfully so. The blocks are not only colorful, but they are easy for little hands to use. The blocks are essentially large and interlocking, and they are extremely entertaining for children and even parents. A major perk of these blocks is that once they are snapped together, they aren’t stuck forever. Little hands can undo them and put them back together. As a parent, you won’t constantly be asked to undo blocks that you think The Incredible Hulk couldn’t even manage to separate. The toys utilize oversize prongs to be stacked together. Since the product was designed with toddlers in mind, the features can be mastered by most toddlers. 80 pieces, which is plenty of blocks to keep toddlers entertained. Compatible with all Mega Bloks sets. Portable bag included for easy on-the-go travel. Optional stickers for letters or numbers. Some users had blocks that wouldn’t snap together well. Block set does not include a base. Wooden blocks are the classic go-to and for a good reason. Their long-lasting quality makes them a great long-term investment. Yay for being durable! There is something about wooden blocks that never go out of style. These blocks are still around because they have a lot to offer. 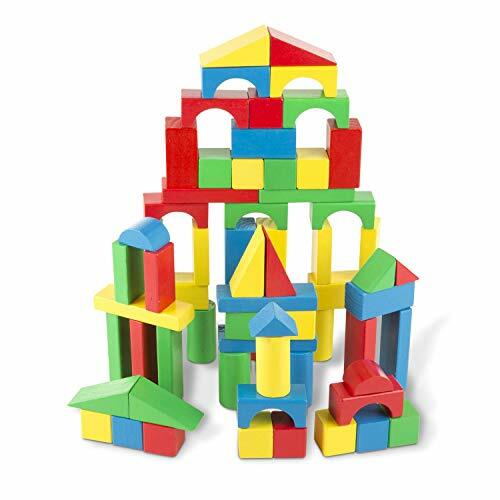 Wooden blocks are light enough for your little one to move around, but durable enough to be knocked down when built into the highest tower for demolition. The durability of wooden blocks is a great asset because that means your toddler can chew or throw these things and they won’t be any worse for the wear. 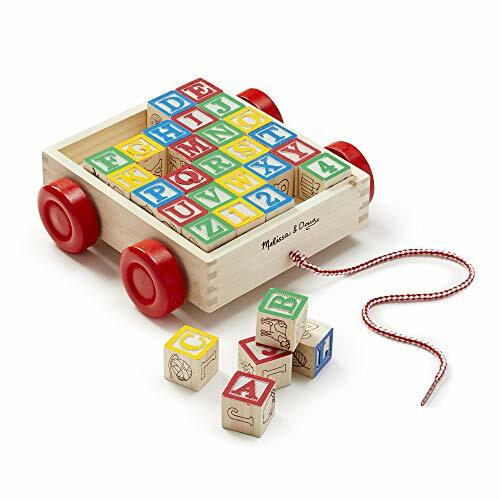 Wooden blocks don’t rely on prongs to snap into place or be connected, so your toddler has more control over how he or she wants to build. This asset helps enhance creativity. Comes in four colors and nine shapes. Classic creative and educational activity. Parents believe some of the wooden blocks included are too small for toddlers. Hand-eye coordination is a major developmental milestone. Stacking blocks allow your toddler to practice this skill along with precision and balance. These blocks should be a toddler and parent must have. I can say firsthand that my son has spent hours upon hours playing with this set. He loves them so much that I purchased a backup just in case the day comes that one set breaks. The blocks can be used two different ways, stacking or nesting. Toddlers will love the freedom to interchange between the two. If one way gets boring, there is a whole other option for entertainment. These blocks have a great educational benefit to them as well. The sides are filled with numbers, colors, shapes, and animals. Your little one will truly pick up on these and it will help him or her learn the order in which to place the blocks. Repetition is key with toys like these and little ones will get a thrill out of stacking these up and tearing them down. Great for hand-eye coordination and problem-solving. Some parents believed the cardboard was not durable enough. If your child drools a lot and puts these into its mouth, the cardboard will wear. Younger babies need simple, yet practical blocks. It is important to find some that are appropriate for little fingers and interesting enough to attract attention. Little hands and minds still need to be kept busy, but it can be difficult to find blocks that are age appropriate. 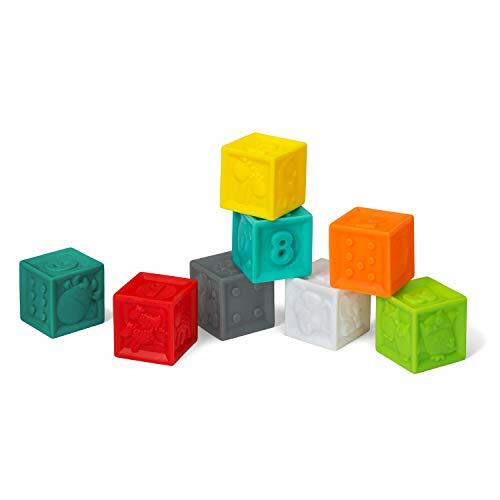 These blocks are a great option because not only are they super colorful and squishy, but they can be squeezed or chewed on with no problems. Your little one can start exploring these blocks at a young age and then eventually utilize them for numbers and letter usage. If you are looking for a block set that can grow with your child, this one has the capabilities. They can start out as cool teethers and transition into fun stacking blocks. A cool perk of these blocks is that they are also bath time safe. Toys always seem to be more fun once they enter that bath water. Fun colors, numbers, and animal shapes. Rubber blocks may have strong smell upon arrival. Buyers said the blocks stack awkwardly. Blocks only count to 8. 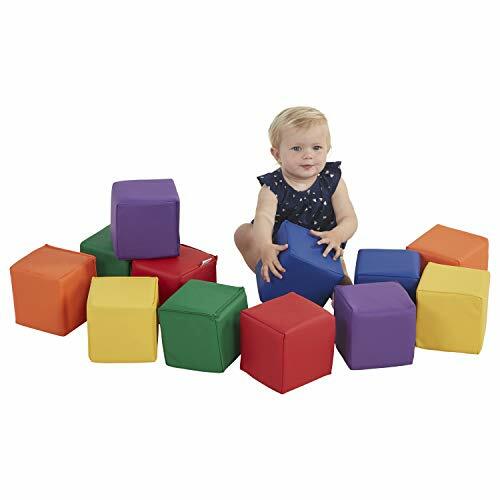 Foam blocks are lightweight and fun for your toddler to move around. Foam blocks are also a win for parents because if you step on one in the middle of the night your life won’t flash before your eyes! Toddlers love these foam blocks because they are large, but lightweight. The size makes little ones feel empowered because they can finally move large objects. The large size of these foam blocks makes them fun and easy to stack. These are more fun than normal blocks because they are much larger. The fact that these include one size — they only come in squares — makes them a little less challenging for toddlers to figure out how to build them together. There are a variety of vibrant color options to choose from and your little one will be well stimulated by whatever color selection you choose. One benefit of these foam blocks is that they ensure safety because of their large size, and the foam is covered with reinforced leather to combat slobber and bites. Foam inside makes them soft for playing. Some users noted the product began splitting at the seams. Some purchasers stated the product was a lot smaller than pictured. Toddlers love designs and blocks with patterns are no exception. If your toddler isn’t amused by a simple block, he or she may love a block with patterns. Simple blocks may not be stimulating enough for your toddler and nothing is wrong with that. Toddlers are still mesmerized by colors and different shapes. 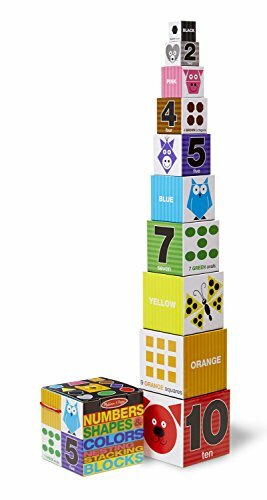 This set of blocks will not only touch on colors and shapes, but it will encourage your toddler to put them in a specific order. Toddlers need some guidance sometimes to tap into their creativity and the wooden boards that are included have pictures that replicate the order in which your little one should place the blocks. It is virtually a block puzzle. You probably never thought your toddler would already be completing puzzles with more than 10 pieces, but you will be surprised at just how fast little ones can pick up on these boards. If you are looking for a fun and beneficial way to entertain your toddler, these block puzzles might be a great solution. 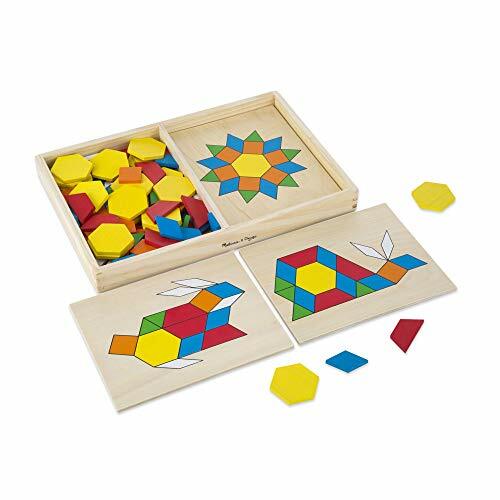 Includes 120 shapes and five boards. Some pieces may be too small. Learning should always be fun and what better way to learn the alphabet than by implementing it into the fun playtime toys? That’s where alphabet blocks come in handy. When you envision ABC blocks, these are probably what you have in mind. The primary color wooden blocks that aren’t too big, yet aren’t too small, are a great toy for toddlers. Your little one will love how easy it is to pick up and move these blocks. No matter which way they decide to situate them, the colorful letters are printed on all sides. These blocks are great because they can grow with your child. You can implement them before your toddler really understands letters, and you can keep them around once your child can start spelling. The durability of these wooden blocks ensures they will last from toddlerhood to kindergarten if your child still shows interest. Classic set that will last for years to come. Includes 30 blocks and a rolling cart. Purchasers said the blocks were smaller than they thought they would be. Some users said they were too small for toddlers to stack. Users noted that there isn’t a logical arrangement of letters and pictures — the X block, for instance, has a picture of a cat. Kids are never too young to start working on the basics of STEM -- all they know at this age is that they are having fun. You’ll be the one who is happy to know your child is learning while they are playing. Some parents want to make sure their toddlers are taking in as much information as possible. 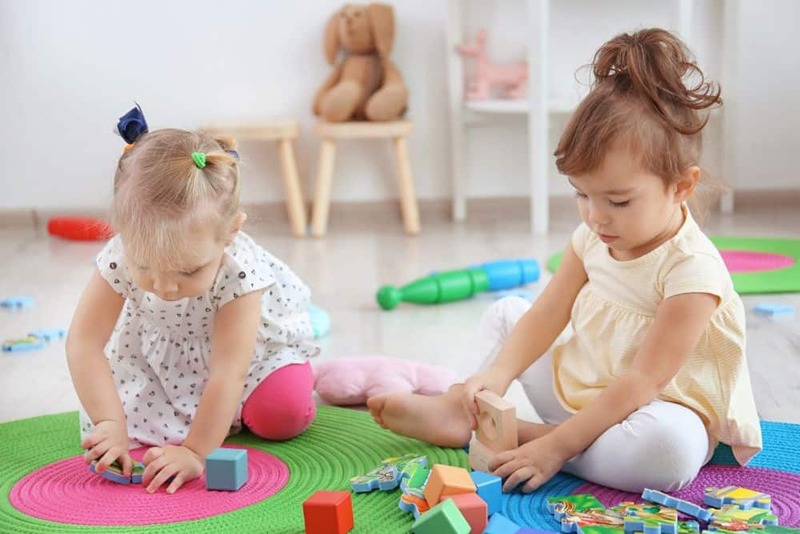 Toddlers absorb their surroundings like a sponge and educational toys can help them do just that. These blocks are complex, but they help promote science, tech, engineering, and math. But to your child, it is just a fun way to stay entertained. The vibrant colors and intriguing designs are captivating for toddlers and keep them mesmerized. There are so many options of how to put these blocks together that your toddler will learn how to take control and make decisions. Smooth tile edges to ensure no sharp points for child. Helps with shape and color recognition. May be difficult for younger children. Does not come with a storage box. Some parents said the magnets fell out. Magnetic blocks take exploration a step further. You will love watching the excitement your little one will exhibit when he or she learns the precise way to connect the magnets so they don’t push against each other. 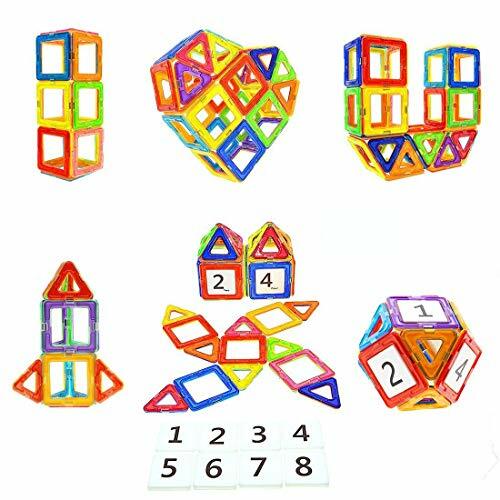 Magnetic building blocks can provide hours of fun because each piece offers its own unique challenge. Your toddler will have the opportunity to try to problem solve with the magnetic blocks because each block has a specific way it must be turned to connect to another block. If your child is up for a little more of a challenge than traditional blocks offer, these might be a great choice. Comes in multiple different shapes. Made of high-quality, non toxic plastic. The pieces are small, so adult supervision will be required. Some parents believed these were better for older kids. Translucent building toys are great for the inquisitive toddler. If your little one seems to be mesmerized by every little thing, these blocks might be a great choice. It is always refreshing to enhance your child’s playtime experience. Blocks are fun, but translucent ones bring their own amazement. Toddlers love the idea they can build an object and still be able to see through it. 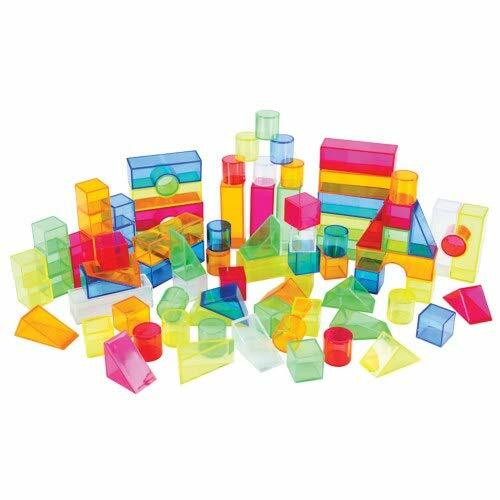 The translucent blocks always help your child visually see how blocks can be built together. The assortment of colors and shapes of all sizes allow your child to have a stimulating environment conducive to learning when engaging with these blocks. These blocks are designed with older toddlers in mind, so there might be pieces that are too small for younger kiddos. 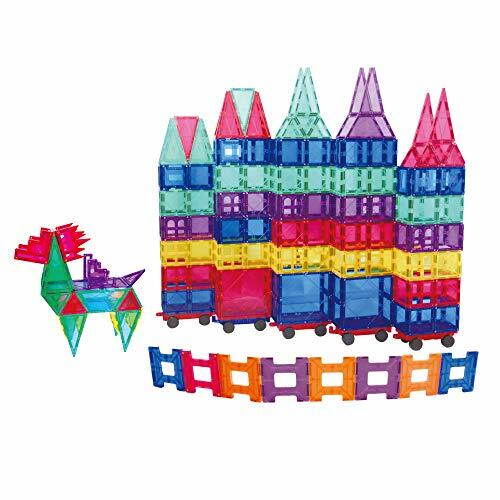 Translucent blocks are lightweight, so if you are looking for on-the-go fun these might become your new best friend. You can bring them along for fun without worrying about weighing down your mom bag any more than it already is! Rainbow assortment of many colors. More expensive than other blocks. If you notice your toddler is responding really well to his or her new blocks, it may be a good idea for you to buy multiple different kinds. But typically, having only one set will do. It would be smart to always start off with one set and see how your little one does. If your toddler responds super well, don’t immediately run and buy other sets. Toddlers tend to jump from toy to toy, so give the blocks a week test. If they are still the popular toy of choice after 7 days, another set might be a great addition. If you are set on having more than one set, opt for different kinds. Magnetic and stacking blocks can be a lot of fun! Blocks are a great toy, but there are certain things to keep in mind before picking up a set and heading to the checkout line (source). Sharp ends: Some blocks may have rather sharp ends and that could be because they are meant for older kids. Sharp ends can poke your little one, especially if he or she decides to try to chew on it. Safe material: In this day and age we would like to think all of our children’s toys have been properly inspected. But you should double check to make sure the material of the toy is non-toxic or the paint is free of lead. Certain small ends: Some blocks tend to vary in size and length. If you purchase blocks with varying sizes and pieces, make sure none are long enough to reach the back of your child’s mouth. Small ends that can reach the back of the mouth are a big no-no for safety purposes. Our top pick is the set of Mega Bloks. These blocks were intricately designed with toddlers in mind and every aspect of the product proves that. The blocks are not only bright and colorful, but they are also easy to stack and undo because of their large size. The large size also ensures your little one will be safe from choking hazards because the pieces are not small enough to enter the mouth. The opportunities are endless for your little one with these blocks because the set is compatible with all other Mega Bloks sets. You can purchase additional sets that include educational numbers and letters. Some sets even include your toddler’s favorite characters like those from Sesame Street! Let us know what your favorite building blocks are in the comments section below.